Brushing teeth doesn't have to be an activity you and your child dread daily. 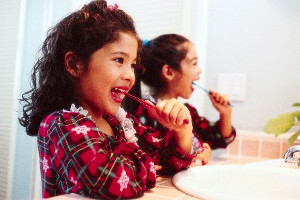 You can engage your child by making brushing fun and by role modeling good oral hygiene. With all the cool toothbrushes and toothpaste options for kids, you can definitely increase your child's excitement for brushing. Check out some of our tips below to help making brushing more fun!! !. Make brushing teeth fun. Look for ways to engage your children in brushing. Make it seem as if if brushing is a fun thing to do rather than a chore. Get your child a fun and colorful toothbrush to start. 2. Allow your children to brush your teeth. Have fun with that, then allow them to brush their own teeth. Finish the session by brushing your child's teeth. 3. Have your child brush their favorite doll's teeth before you brush theirs. Remember to routinely give them the opportunity to brush their own teeth and then follow up by brushing their teeth correctly. 4. Use only a pea-size amount of toothpaste on your child's toothbrush. Larger amounts tend to be difficult for kids to handle by creating too much foam an overwhelming your child's mouth with toothpaste! 5. Be careful of the toothpaste you use. Many toothpastes contain strong flavorings that adults may not notice, but that can sting young mouths. Use a toothpaste that's specially made for kids. 6. Be a good role model and go up to the bathroom eager to brush. Laugh and make it sound really fun. Your child just may realize that they are missing out on something fun and will want to join in. 7. Use an oral hygiene chart. Don't forget to take a look at our Free Printable Dental Care Charts! A new fun toothbrush or toothpaste is a great reward for your chart. 8. Don't forget to praise, praise, praise your kids for their awesome brushing. Sometimes praise and positive feedback is enough of a reward to motivate a child! Catch your child doing a great job brushing with one of our Caught You Coupons!